The entrance to Ghosts and Legends. This article is a critique of the attraction and is not affiliated with it. In 1997, James Cameron’s “Titanic” came to movie theaters everywhere, shattering all previous box office records. One result was that the Queen Mary began to see a dramatic increase in attraction attendance. This was because of the public’s desire to see and touch an ocean liner similar to the Titanic. The Queen Mary was in fact built as a replacement for the Titanic generation of ocean liners. 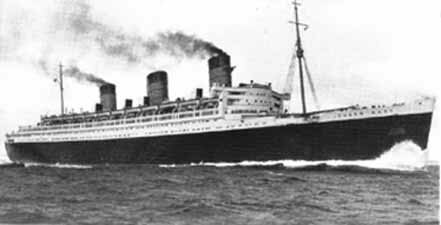 The Olympic, the surviving twin sister ship of Titanic, was retired in 1935 as the Queen Mary was being built by the merged Cunard-White Star Line. 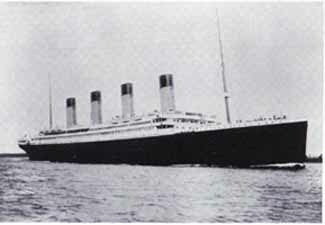 Indeed the Queen Mary and the Titanic share many similar characteristics that drew the public to her in the wake of the movie’s success: exterior appearance (the funnels, the well deck, the forecastle deck, the boat deck, the sheered, riveted black hull with white superstructure), the elegant interiors, the different amenities available from 1st class down to the crew, etc. the ship in the wake of the movie's release. In 1998 as a direct result of the broad release of the movie “Titanic” the Queen Mary attraction in Long Beach was profitable for the first time in years. So then why did so many people come once and not come back? The public came on board wanting to experience an environment like they saw in ‘Titanic’, however a great deal of what they came to see was no longer there for them to see. As our Deck by Deck series poignantly points out, many of the amenities that the public came to see were removed in the conversion. Other things still in place were not on the “Ship Walk” or even the guided tour routes. Several of the major first class public rooms on Promenade Deck are still in place, but as they are now multi-purpose banqueting rooms that are stripped of their luxurious furnishings, lit with industrial white fluorescent lighting, and kept dark between events, they hardly evoke the elegant atmosphere that the public paid to see. The gymnasium was located on the Sun Deck amidships much as it was on the Titanic. 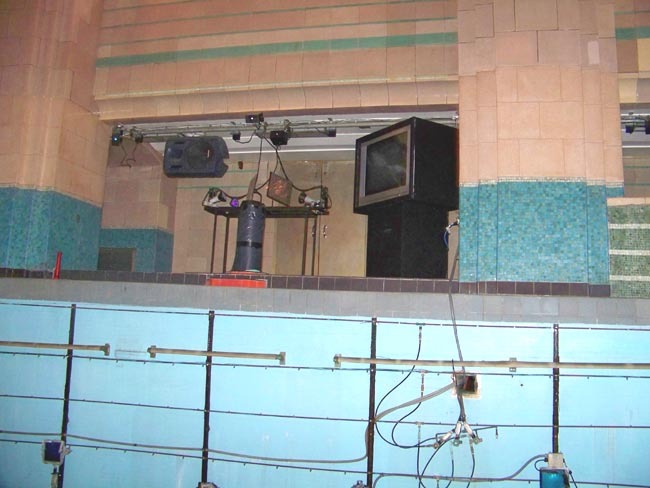 It was the scene of an important part of the film but the original gymnasium area of the Queen Mary is used as a seating area for a fast food operation. The massive boiler rooms, again, the location of a memorable scene in the film, were gutted during the conversion. They sit empty to this day. The cargo hold that people remember in the movie as the setting where a romantic interlude occurs is locked tight on the Queen Mary and off limits to the public. 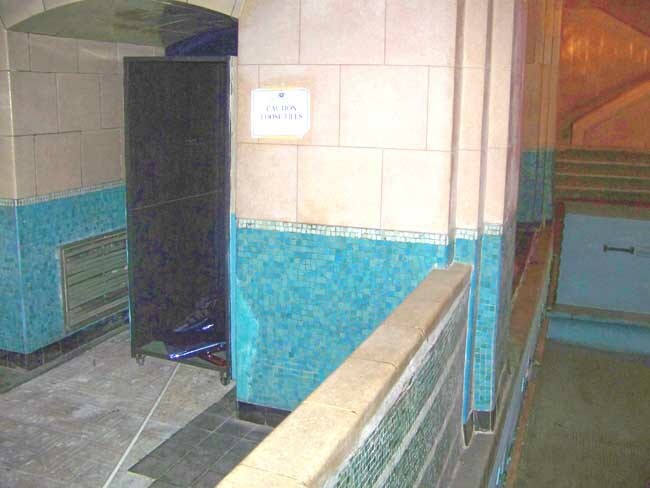 The real wireless room, located in a very similar location to that on the Titanic and the place where a life and death struggle took place on that fateful April night, was removed from the Queen Mary and used as part of an exhibit area to display objects from areas removed from the ship. An amateur ham radio club, mis-labeled “the wireless room”, sits in for it today in what was the upper level of the squash court. 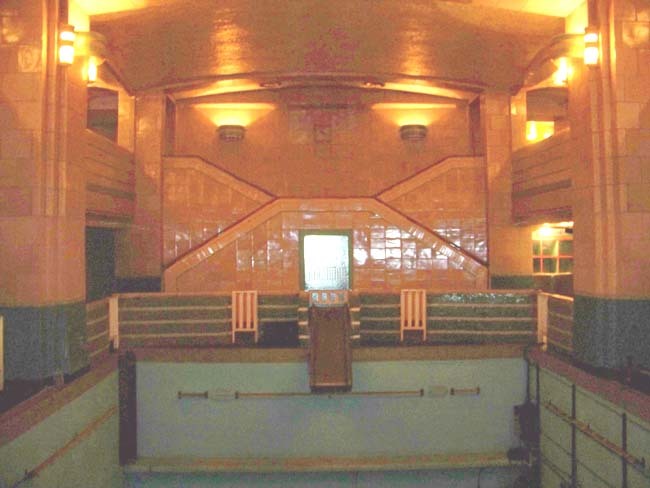 The 3rd Class Areas that played such an important role in the film were mostly removed from the Queen Mary during the conversion. There’s not one original 3rd class cabin left on the ship. All the public could see was a single mock up of a 3rd class cabin in an “exhibit area”. They could see this in the traveling Titanic artifact exhibit and it’s certainly not what they came to a real ship to see. In fact, the public that came to the Queen Mary was greeted with “exhibits” that highlight just how much of the real Queen Mary is now missing. So what did all this mean for the historic ship? She was making greater profits than ever, but what was done to give the public the true Queen Mary experience that they paid for and bring them back? Were they finally going to get to see the restored gymnasium and wireless room, the luxuriously appointed public rooms, a restored section of 3rd class accommodations, or maybe even a recreated boiler room? The answer came in the year 2000 when then lessee, RMS Foundation / QSDI, installed the Ghosts & Legends attraction in a 25,000 square foot area that includes portions of the 3rd Class Dining Room, the 1st Class Swimming Pool, areas on forward R, C, and D Decks, Boiler Rooms 2, 1, and the Water Softening Plant, and finally, Cargo hold number 2 where an elevator was fitted into the shaft to take visitors to the tour’s exit point in the gutted 3rd Class Smoking Room. 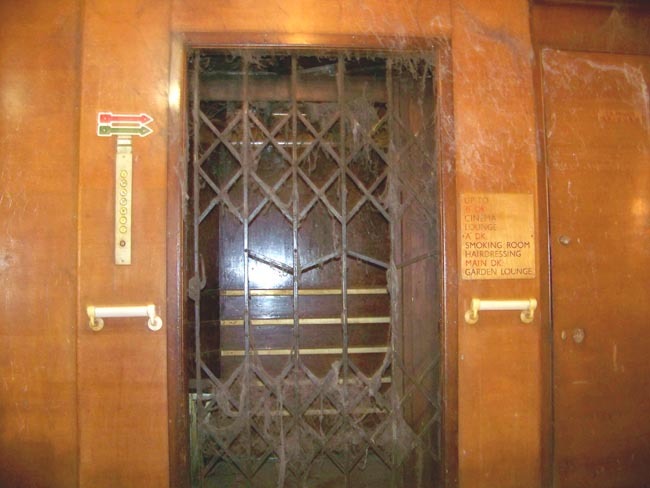 This elevator blocks any view of one of the most spectacular sights on the ship. The port side of the 3rd Class Dining Room today, stripped and used as the entrance to the ‘Ghosts & Legends’ tour. A hallway built into the starboard side of the 3rd Class Dining Room. This is the hallway that exits the pool on the tour. The 20 to 30 minute tour uses special-effects lighting, smoke effects, and other theme-park tricks to dramatize supposed “paranormal” events from the ship's past. 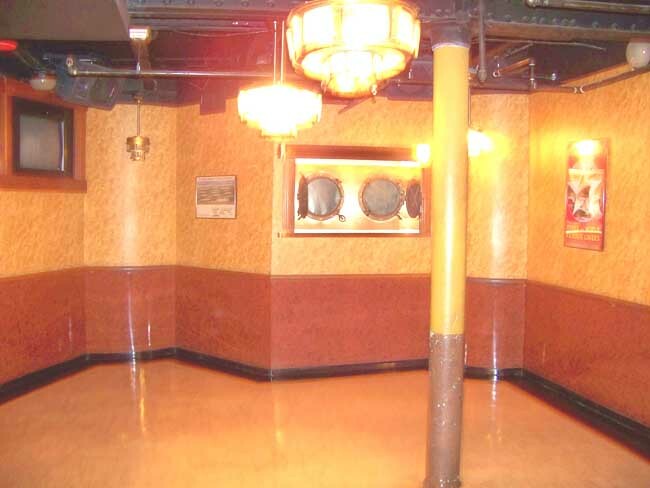 After you are taken into a “staging area” built into a portion of the 3rd Class Dining Room, you are led into the R Deck level of the 1st Class Pool where you are told a story about a “ghost child” and given a story about wet footprints appearing on the deck in the area. The staging area built into the port side of the 3rd Class Dining Room where a video presentation is shown. The light fixtures are from the Long Gallery. Today the pool is empty, poorly lit, run down, and used as part of the ‘Ghosts & Legends’ tour. 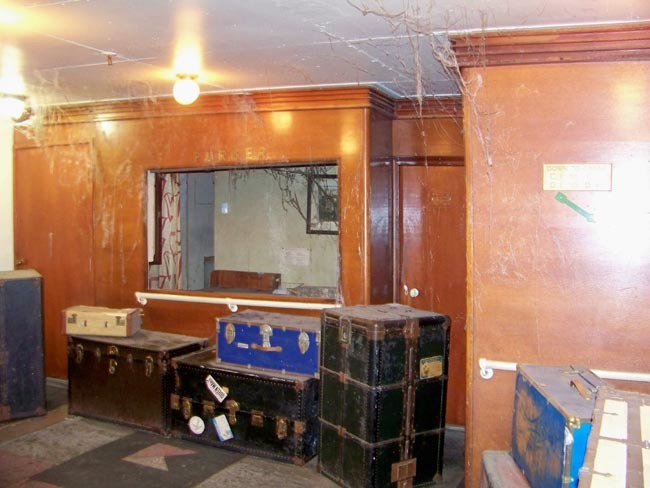 Part of the 3rd Class Elevator Lobby on forward R Deck decorated with spider web and made to look run down for ‘Ghosts & Legends’. The 3rd Class Elevator today. Out of order and covered in spider webs. 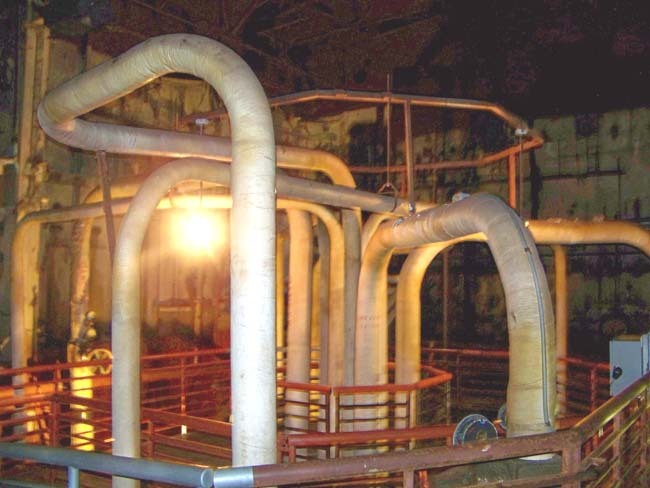 Next, you are taken through portions of C and D Decks and down an elevator into Boiler Room Two where an odd-looking tangle of pipes is used to simulate a boiler explosion. The tangle of pipes in Boiler Room 2. After this, you are led to Boiler Room One where you meet “Half Hatch Harry”, in a less than sensitive interpretation of an actual incident where a crewman named John Pedder was killed when he was crushed by a watertight door – elsewhere on the ship. A view looking from Boiler Room 2, through Boiler Room 1 and into the Water Softening Plant in the distance. A view looking from Boiler Room 1 into Boiler Room 2. The elevator brings guests down to G Deck from D Deck. The Water Softening Plant today. 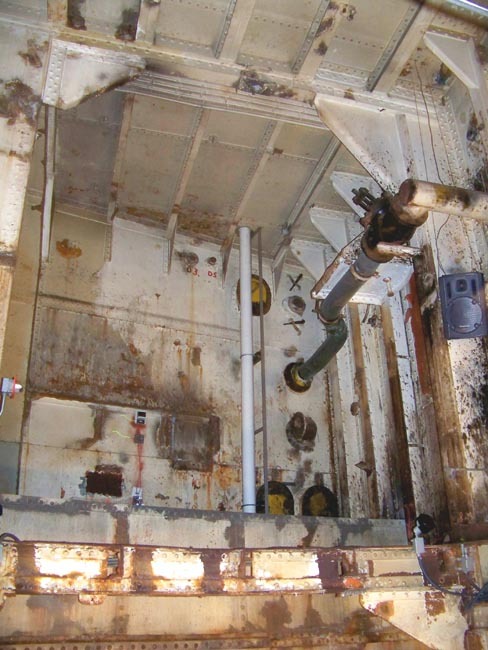 The white pipe in the center of the photo goes down behind a prop bulkhead that houses a tank of water to simulate a hull breach. The lessee once made the claim that “Ghosts & Legends saved the Queen Mary.” That is a curious way to cover up for a failed attraction. Separate admission was charged for the tour at first however it didn’t take long before it was included in the price of a general admission ticket. How can it be making a difference if it’s not even a separate ticket? Did the interest in the ship after the hit movie was released and the resulting spike in attendance teach the city and the lessee anything? Why wasn’t anything done to give visitors to the ship the real Queen Mary experience that they paid to see to get them to come back? Finally, what has been done with the areas of interest mentioned before where their advertised restoration may have brought back repeat visitors? The 1st Class pubic rooms are still multi-purpose banqueting rooms, rather than being assigned specific functions so that their luxurious furnishings can be returned. The wireless room retained the exhibit function for a while longer. 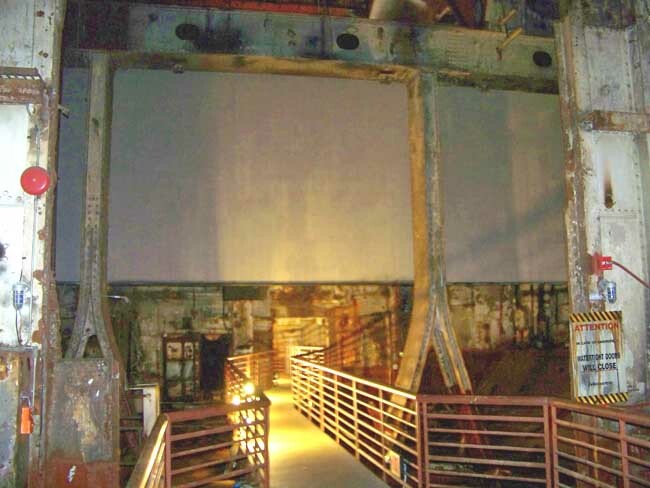 It was further damaged in 2007 by having large portions of its steel walls cut out so that it could be used as part of a “gallery” showcasing exhibits totally unrelated to the ship such as rock & roll photography. The gymnasium is still a seating area for a fast food outfit. The 3rd Class cabin areas are still gutted with some being a dumping ground for old furniture. The Boiler Rooms are still gutted although 1 and 2 now have a few special effects devices housed in them. 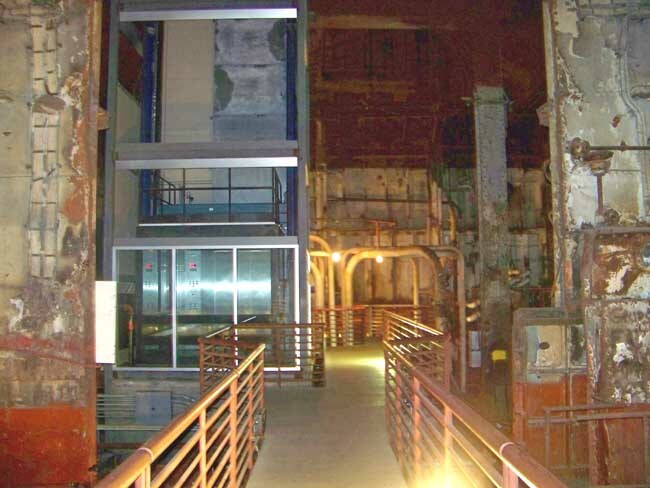 Cargo Hold Number 2 still has had an elevator stuck down its shaft making it impossible for visitors to view. A major concern is that the pool’s deterioration is being exploiting for this theme park act. Anyone who has ever been to the Hotel Queen Mary knows that the pool is behind those locked doors on R Deck and always questions why it has never been available to hotel guests. The answer is that settling is occurring due to a structural flange being removed during the conversion. Rather than restoring the pool to working order for hotel guests use, its deterioration has been exploited for “Ghosts & Legends”. Tiles are cracking off around the edge of the pool tank where it feels like the tank is starting to slope downward. 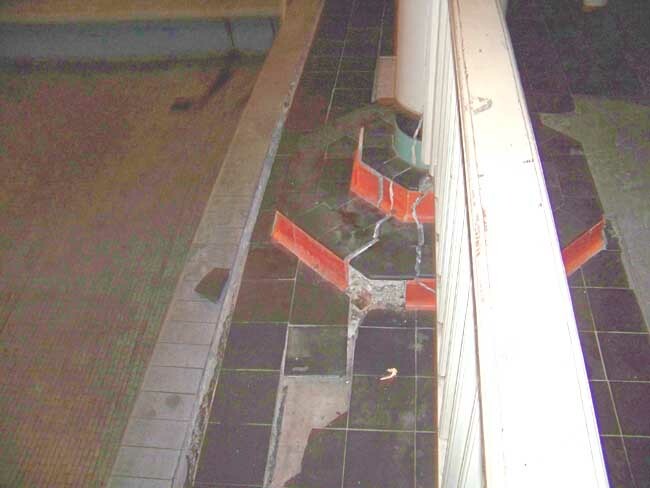 The C Deck level has large areas where floor tiles have popped loose. These are then simply removed leaving an ugly exposed area. The tank itself has been littered with fog making equipment and other areas are stuffed with strobe lighting. Tiles around the tank are cracking apart and breaking off due to a structural problem that has yet to be fixed. 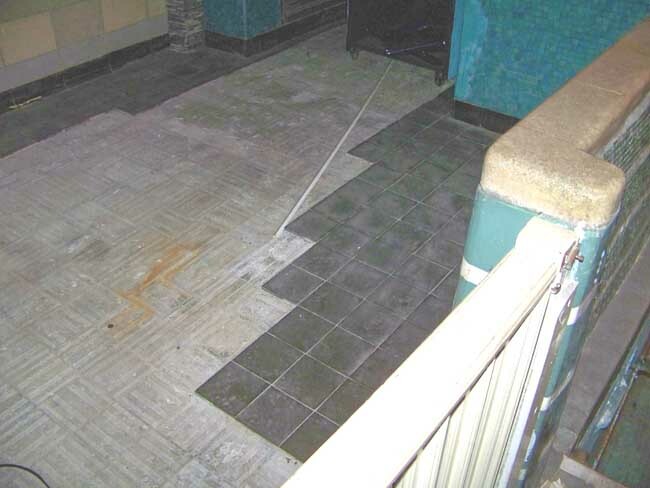 Tiles pop off and are removed leaving an ugly exposed area. Notice the stack of removed tiles in the top left of the photo. 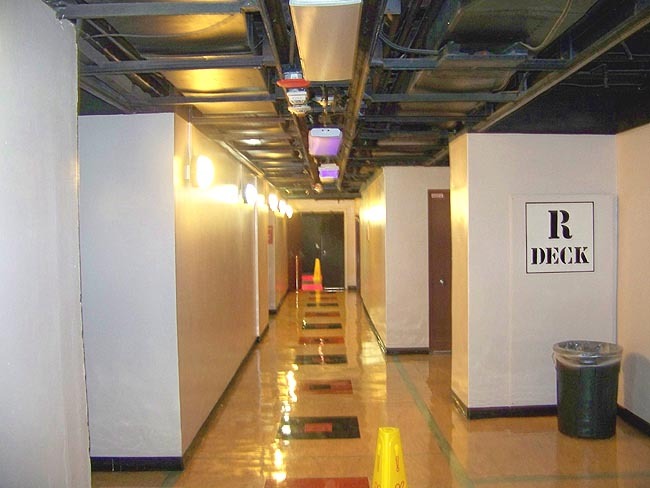 Sound and lighting equipment blocks a hallway around the pool. The sign on the column says ‘Caution: Loose Tiles’. Another view of some of the equipment that litters the pool. The hoses that line this side of the pool tank fill it with fog. Ultimately, the surge of interest in the Queen Mary that came as a result of the success of the movie “Titanic” taught the City of Long Beach and the lessee nothing. The revenue that resulted didn’t go to give people the restored ship that they paid to see. Instead, it went to install a theme park attraction that exploits the ship’s deteriorating condition which is ultimately the reason why so many people are only one time visitors to the ship as several travel review sites indicate. So the Queen Mary is one big mess that needs to be fixed. Where would you start true restoration of the Queen Mary? The first thing the ship needs is a service, supply, and distribution center and a working alley that doesn’t intrude on the original passenger decks of the ship. This is most easily and cost effectively fit into D Deck since one half of C Deck was removed in the conversion. Once this is in place with two sets of service elevators fore and aft, the ship will have a real working alley running beneath all of the original passenger decks. This is the single most critical element missing from the ship today that prohibits true restoration. Deckplan illustrating our preservation and adaptive reuse plan - Option "D"
Once the working alley is established, the original three dining rooms on R Deck can be restored and used as the banqueting center for the ship. The original or like furniture can be permanently returned to these rooms, largely eliminating the huge table and chair storage requirement that is the main cause of damage to the Queen Mary’s delicate wood veneered interiors. 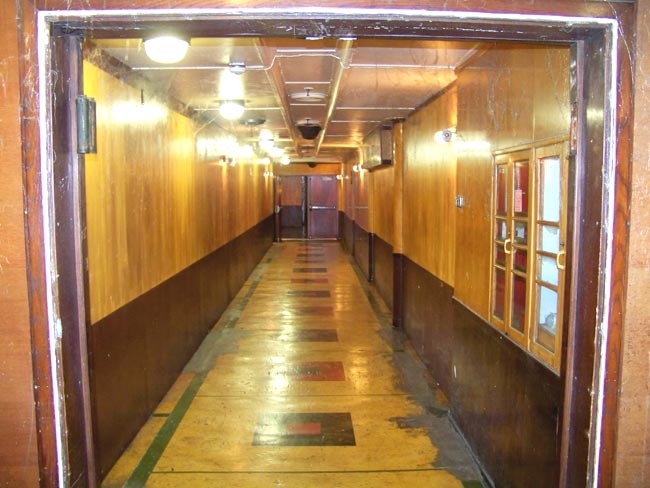 Next, to fully restore Promenade Deck for use as the hospitality center of the Queen Mary, both of the restaurants obstructing the starboard enclosed promenade and their associated kitchens need to be moved up to Sun Deck. The forward deck house on Sun Deck also has key features such as the gymnasium, squash court, and wireless room that can be restored as part of the attraction. The squash court might also be used by hotel guests and Club Queen Mary Members. The suite of 1st Class public rooms is restored on Promenade Deck as an entertainment center and hospitality suite. The luxurious furnishings designed for these rooms can finally be returned, using them for a purpose close to what they were designed for and eliminating the massive chair and table storage requirement that is the major cause of damage. The restoration of the hotel decks and associated suite of 2nd Class public rooms as part of the hotel guest/ Club QM amenities, can happen at anytime in this order. Finally, the lower decks that are occupied by “Ghosts & Legends” (Cargo 2 aft through the Forward Turbo Generator Room) and the still remaining portions of the power train (Aft Engine Room, the Propeller Shaft, Emergency Steering area) are integrated into a world class tour on the Power Train of this great liner. Since Cargo Hold 2 is the main cargo hold on the ship, the elevator equipment is relocated to Cargo Hold 1. This elevator takes guests from R deck forward down to G Deck where they are led aft into Cargo Hold Number 2. Perhaps the opening to this cargo hold might be covered with a semi-clear weatherproof top that allows light to shine right down to G Deck so that guests see this large and impression hold at its best. After this, guests are led aft to the Water Softening Plant where they are given explanations of what the major pieces of recreated machinery here once did. Next, we move aft to Boiler Room number 1 where guests see recreations of the large and impressive Scotch Boilers that provided the ships hotel service’s power. Perhaps the present day heating plant that the RMS Foundation placed on the wharf alongside the bow might be relocated aboard the ship within these simulated Scotch Boilers. Finally, guests are taken aft to the recreated Forward Turbo Generator Room and given an explanation about the massive generators and switchboards that powered the ships systems. After traversing the gutted Boilers Rooms 3 and 4 which we assume will be developed for use in conjunction with the current Exhibit Hall (it is comprised of the former aft turbo generator room, Boiler Room 5 and the forward engine room) the tour concludes by visiting the existing aft engine room, propeller alley, emergency steering room and remaining propeller. Ghosts and Legends is a misguided by-product of the movie “Titanic”. Even more to the point, it is the offspring of the flawed operational plan put in place in the 1970’s that has been such a cause of damage to the ship. If it is finally discarded into the trash bin of history along with the theme park style operation, we believe that the Queen Mary stands a much better chance of recapturing the imagination of the public and being a place where they want to come to and to return frequently . * The TAPS organization from the hit TV show ‘Ghost Hunters’ came aboard and couldn’t find enough evidence to support the claim that the ship is haunted, in fact, some of their equipment had been tampered with by someone. Whether it was someone connected to the operation of the ship or not is speculation but the findings of the show are not.